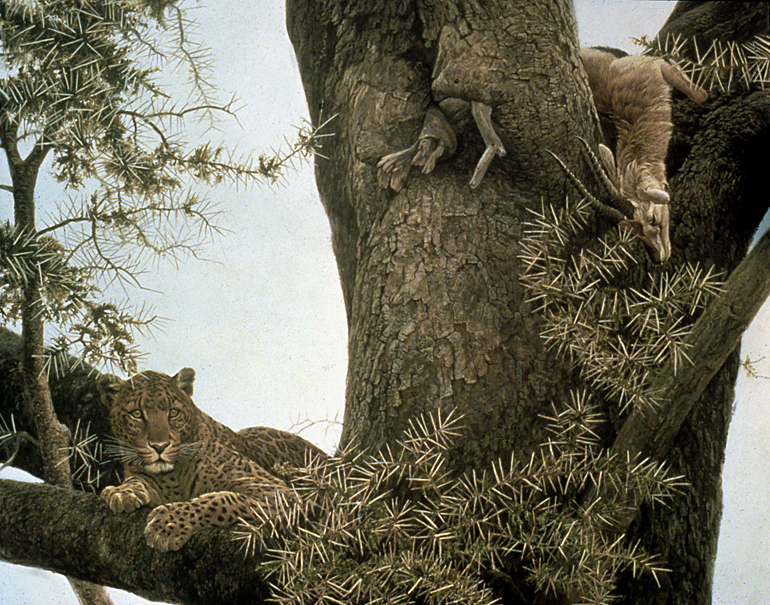 This scene of the leopard with its Thomson gazelle prey was one I actually witnessed. In all of my trips to Africa, I have only once seen an actual kill, although I have been present after the fact on a number of occasions. Witnessing a leopard making a kill would be very difficult since they hunt mostly at night in areas of thick cover. This particular kill would not have been typical as Thomson gazelles generally avoid thick cover. They in fact prefer broad, short-grassed plains not only for the food, but also so that they can see approaching predators. Either this kill was made at night or the Thomson gazelle was very foolish and came too close to the thick vegetation along the river where the leopard was lurking. The leopard has hauled its prey up into the tree to keep it away from hyenas and lions that would be all too eager to steal it. As often happens, the predator is in no rush to eat. The activity of catching the prey and dragging it to safety is usually exhausting.